As well as the main symptoms muscle pain, tenderness and fatigue, people with fibromyalgia syndrome can get a range of gastrointestinal symptoms. These include heartburn, which can be caused by acid reflux (also known as gastro-oesophageal reflux disease [GERD or GORD]), or irritable bowel syndrome (IBS). Heartburn is uncomfortable, and can disturb sleep patterns, which can make the tiredness associated with fibromyalgia syndrome even worse. Other gastric symptoms can include pain, discomfort and difficulties with swallowing. According to a study conducted by a doctor in Ireland in 1991, 70% of the people with fibromyalgia syndrome also had irritable bowel syndrome (IBS), and 65% of the people with IBS had fibromyalgia syndrome. Around 40 to 70% of people with fibromyalgia syndrome have gastro-oesophageal reflux disease. 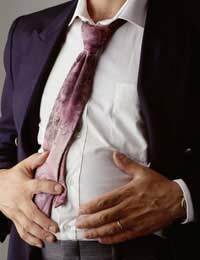 If the valve at the top of the stomach (the lower oesophageal sphincter), is weak, it can allow some of the contents of the stomach, including stomach acid, back up into the oesophagus (the tube that connects the mouth and stomach, also known as the food pipe or gullet). When acid comes back into the oesophagus, it can cause the uncomfortable burning feeling of heartburn. Other symptoms include belching, pain, coughing and feeling sick. The acid in the stomach needs to be very strong to help the digestion of food. If the lining of the oesophagus becomes damaged and inflamed by the acid, this is known as oesophagitis. IBS can cause heartburn, as well as stomach pain and discomfort, attacks of diarrhoea or constipation, nausea, feelings of fullness and bloating. Working out what the heartburn triggers are, and avoiding them where possible can help – these will differ from person to person. Small changes to the environment can help too even something as simple as putting blocks under two of the legs of the bed to allow sleeping with the head six to eight inches higher than the feet can improve symptoms, by helping the acid drain back out of the oesophagus more quickly. There are a number of prescription and over the counter drug treatments for heartburn. These include antacids, which neutralise the acid already in the stomach, drugs that reduce acid production in the stomach (proton pump inhibitors or H2 blockers), and drugs that help food move more quickly through the digestive system (prokinetics). People with fibromyalgia syndrome, especially those already taking drugs, should not take additional over the counter remedies without consulting a doctor or pharmacist. If digestive symptoms change suddenly, this can be the sign of another illness that may be serious – always see a doctor. @Holly - you can contact FMA UK which is the registered charity. It has plenty of content and shows you how you can get involved. Link here. I hope this helps. Hi After a few months of a stiff neck and generally aching and stiffness recently I went to my doctor.He is sending me to a rheumatologist and mentioned the possibility of Fibromyalgia.Id heard the word before but ever really known what it was....so I googled it!I could cry - for as long as I can remember I've suffered with restless leg syndrome (but intermittent unexplained stiffness. maddeningly itchy hands (occasionally), weakness in my wrists, irritable bladder (which really effects my life) and no one has ever linked everything together.If I'm stressed everything gets worse, I can't sleep, I feel foggy, my body feels irritable and I ache like I have flu.I get low blood sugar which hits me out of nowhere and I get shaking and perspire.....this has to be what I'm dealing with.Wish I'd known before, but hopefully I'll be able to better deal with it now.Restless leg and bladder problems are miserable! !Can't believe there's a link between all of these things!! Any tips on where to start??? I have believed for a long while that my 19 year-old grandson has fibromyalgia and I couldn't believe it to hear that night terrors are a symptom, as he suffers badly from these. His doctor is very unsympathetic. It seems to run in my family, as I have it, my sister also, and my daughter. Thanks so much for giving so much information.